I am a very colourful character (female) who dresses back to front and gets into a muddle in the show. The show is very funny and I perform childrens magic. 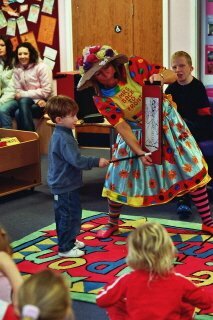 songs, balloon modelling, games and I am a Punch & Judy Professor. I also play games including parachute games. I also have a Healthy Eating show this includes info. about Healthy food and tasting and lots of fun. I also have a walkabout costume called Petuna Pot. It is a walking Flower Pot with puppets coming out.